Doc’s Sports is all about helping the average bettor find new ways to get ahead of the books. Wagering your hard earned money is not something to take lightly, and every possible way to get an edge should always be fully utilized. We firmly believe that specialization is a great way to earn a profit in the world of sports betting. This season I’m going to be following the Rice Owls, a team we basically picked at random. An under-the-radar team like Rice isn’t as well-known by the sportsbooks and the general betting public, which gives us an opportunity to take advantage of some relatively soft lines. I’ll be keeping track of the Rice Owls beat writers, reading the Rice Owls fan forums, and following team members on Twitter. Each week I’ll be making a pick on either the spread or the total for the Rice Owls game. I’ll update my record at the end of each weekly article. We will be using Doc’s Sports Unit Betting System for each pick and this article will be available on Fridays each week of the college football season that Rice plays. David Baliff took over this team in 2007. In his first year as coach, the team went 3-9. 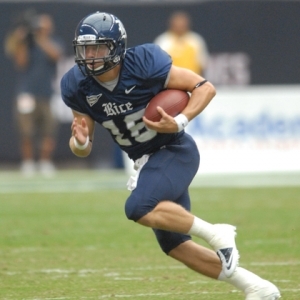 In 2008, Rice was one of the biggest surprises in the nation as they went 10-3. They won the Conference USA West Division that season, and they finished the year with a victory in the Texas Bowl. The Owls were right back to their losing ways in 2009 as they finished a miserable 2-10. Last year, the Owls did show improvement, but they still finished at just 4-8 overall. Taylor McHargue will be the Owls starting quarterback as they head into the 2011 season. McHargue suffered an injury in Week 2 last year, but when he returned he led the team to two straight victories to finish the season. Michigan transfer RB Sam McGuffie had a breakout season in 2010, and the team has high expectations for him this year. McGuffie led the Owls in both rushing yards as well as pass receptions last year. Sophomore RB Jeremy Eddington actually led the Owls in rushing in the team’s last three games, and he should serve as a great change of pace back for Rice. The Owls should be solid on the offensive line this season. This unit has 109 career starts coming back, which is ninth most in all of football. This is the side of the football that has held the team back in a big way the last couple years. How bad was this defense last year? Rice gave up 38.5 points per game in 2010. The team’s top three tacklers were all in the secondary last season, and that is never a good sign. The team returns eight starters from last year’s defense. Is that really a good thing when they performed so poorly? The good news for Rice fans is Scott Solomon will be back at the defensive end spot, where he was dominant in 2009. Solomon missed last season with an injury, but the NFL scouts are wild about him and he should certainly help this defense a great deal. Opposing offenses averaged 304 passing yards per game in 2010. Senior free safety Travis Bradshaw is the leader of this secondary, and he earned second team all-conference honors last year. - The Houston Chronicle’s Rice Owls beat writer Joseph Duarte pointed out this week that Rice has lost 41 of its last 42 meetings with Texas. The team has lost 21 straight games at Austin. -MK Bower of Fox Sports Houston is predicting a 5-7 record for the Owls in 2011. He believes Rice will be much better than last year, but the nonconference schedule will be too much to overcome. - The ‘over’ is a stunning 25-4 in Rice’s last 29 road games. - Rice is 2-8 ATS in their last 10 games against a Big 12 opponent. Reading transcripts from the Rice Owls press conference this week, I get the idea that Rice is feeling pretty comfortable in this one because of their relatively good performance in last year’s 34-17 loss to Texas. I think this could actually work against the Owls in this one. Texas went 5-7 last year, but the Longhorns have far too much talent to be that bad again in 2011. Last year’s game might have been relatively close, but that hasn’t been the norm in this series. The Longhorns beat Rice by an average of 43 points in the previous four matchups. I think the oddsmakers are too low on Texas in this one. I like Texas -24 (-110). We will be back next Friday for a pick in the home opener vs. Purdue.